A park space and new office and apartment buildings are planned at Cambridge Crossing, formerly known as NorthPoint. One of the biggest development projects in the core of Greater Boston is getting underway in earnest. 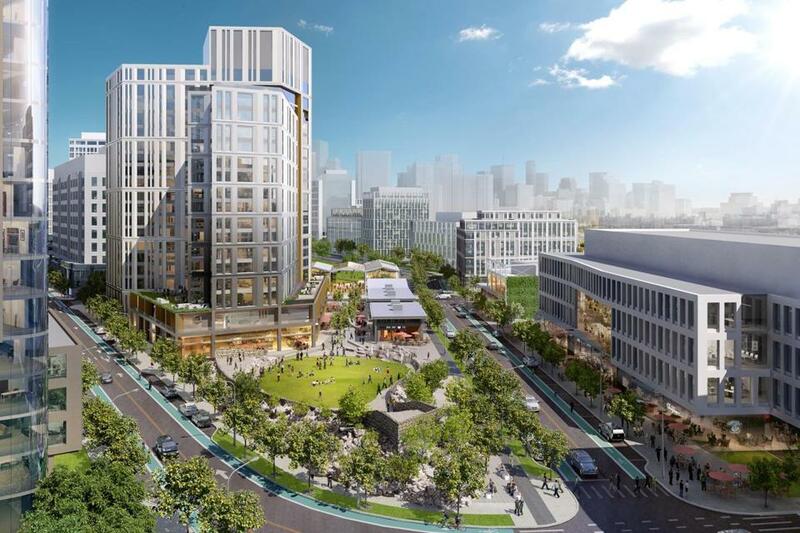 DivcoWest is readying several construction sites for its 45-acre NorthPoint campus on the borders of Cambridge, Boston, and Somerville, where it plans to put five office buildings and about 2,400 condos and apartments over the coming years. It’s also giving the place a new name: Cambridge Crossing. It’s a kickstart to an enormous undertaking that has been in the works for more than a decade but is only partially built. Divco, a California-based developer that specializes in tech and life science campuses, paid $291 million in 2015 for 17 undeveloped parcels, and has been pushing an updated plan through permitting in all three cities. The company broke ground on its first building in May, and is ready to hit the gas, said Tom Sullivan, Divco’s president of development. “We’ve had some very good interest from prospective tenants already,” he said. Divco is pitching the project as an alternative to Kendall Square, just a few blocks to the south. Kendall rents have surged as a parade of big-name tech and life science firms have moved in. NorthPoint, or Cambridge Crossing, will be less expensive, but offer access to the same workforce, especially after the new MBTA Lechmere Green Line stop is built there, Sullivan said. He said Divco aims to make Cambridge Crossing an attractive place to be — and not just an office park — by adding retail to the ground floor of many buildings, and by putting a large park at the center of the project. It’s also opening up streets and hoping to connect the complex more closely to nearby residential sections of East Cambridge. The company also starts work on a low-slung building with restaurants around an open-air plaza, geared as an amenity for tenants in the office building next door. Sullivan said Divco is talking with potential tenants looking for large space in Cambridge, but wouldn’t divulge any names. The project has been viewed as a potential landing spot for Amazon, should the e-commerce giant choose to put its hotly pursued “second headquarters” in Boston. At roughly 2 million square feet of office space, it wouldn’t be spacious enough for the entire 8 million square foot campus Amazon envisions, but the site could provide a starting point. Sullivan would not say whether Divco was preparing to make a proposal to Amazon.